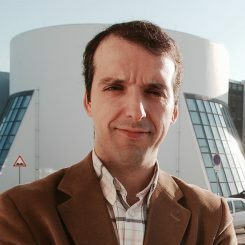 Nuno Fonseca is a researcher and professor at the Polytechnic Institute of Leiria, and invited professor at the Superior School of Music of Lisbon. He holds a PhD in electronic engineering from the Faculty of Engineering of the University of Porto. He is also the author of the book “Introduction to Sound Engineering” and co-author of the book “Development in iOS”. Founder and CEO of Sound Particles, where he develops state-of-the-art audio spatialisation software, and has as clients the top Hollywood studios who use his software in films such as “Batman Vs Superman”, “Independence Day”, “Ghostbusters” , etc. He is a member of the technical committee of AES (Audio Engineering Society) and president of AES-Portugal.